If you need an extra space in your room, especially knowing the actual price of the M2 these days in the large cities, the best way is adding a raised bed or bunk bed into the bedroom. You can build it without any problem with some wooden pallets, and you’ll win some valuable meters and don’t feel like a canned sardine. Joining some full pallets is an easy way to get a solid structure to hold a bed above, at the end the pallets are structurally very strong, they are designed to withstand heavy weight loads without any problems, this allows us to use them as modules when building structures like this bunk bed, both vertically and horizontally you only need to join them with enough boards and nails. Here is a similar bunk bed to the one showed before, but housing a storage space under it instead of a bed. The rail built is also very successful. In this pallet furniture design the space over the bed can only be used to place objects, eg store blankets and cushions. This design is actually built with conventional wooden boards, but could easily be adapted to be built with pallet planks, however it’s a challenge that combines a double bed with a single bed. Of course we cannot forget our pets, they also have the right to have their own bunk beds, in this post we explain in more detail this animal bedding solution. About this raised bed I recently talked to you in this post, it was very successful at the time, it’s certainly very well executed and very attractive for a youth room. And we continue using the full pallets to create elevated structures for the beds, in this case they have created little structures imitating the bigger one of the bunk bed, these structures can be used as stairs to climb to the bed, or as small seats if the occasion calls. Finally with the pallets we can create hanging beds like these ones, they are very nice but you should build them properly so they wouldn’t be dangerous, I also speak of them in this post. They are a great solution to the space problems of the modern life and very economic too, if you build yours don’t forget to send it to our Facebook Fanpage! 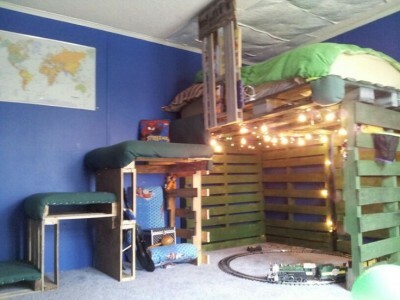 Do you like this pallet furniture for the kids bedroom? Do you want to look for more pallet beds?